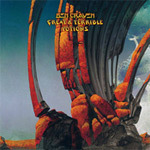 Having artwork from Roger Dean (Yes, Uriah Heep, Asia) will give you one large clue to the music within Ben Craven's second release, Great & Terrible Potions. Craven designs, from its early roots, classic progressive rock, and makes no apologies for his indulgence or extravagance. He doesn't have to, really, because he's very good at composing and performing the music he loves. Sometimes light, sometimes intricate, other times symphonic and nearly bombastic, Ben Craven unleashes a pleasing platter of classic melodic prog rock tunes on Great & Terrible Potions. A little old school organ and some interesting drumming inform the clever ear candy of the opening instrumental, and aptly named, Diabolique. For lighter, and lesser complex, fare Nobody Dies Forever in two parts offers simple melodic rock. The first part is weightier with sound fret work, the latter more ethereal and light. Atmospheric space rock meets guitar rock on Ready to Lose, and once more Craven offers a strong guitar solo. The conjurer is another instrumental driven by bright piano work. The longest track, No Specific Harm, widens the progressive: a bold opening begins an arrangement driven by guitar, but made clever by shifting movements. Later, the title track has Floydish feel from opening combination of vocals and piano to the concluding ethereal and solemn guitar solo. Rounding out the album, Craven offers 'single edits' for three of the songs, shortened versions for radio airplay. For fundamental and classic melodic prog rock Ben Craven's Great & Terrible Potions is a highly creative, entertaining, and nearly flawless work. Strongly recommended, especially if you like your prog old school. For fundamental and classic melodic prog rock Ben Craven's Great & Terrible Potions is a highly creative, entertaining, and nearly flawless work. Strongly recommended.